When most preteen kids form a band, it typically starts and ends with middle school – maybe it'll last through your high school years, if you're lucky. 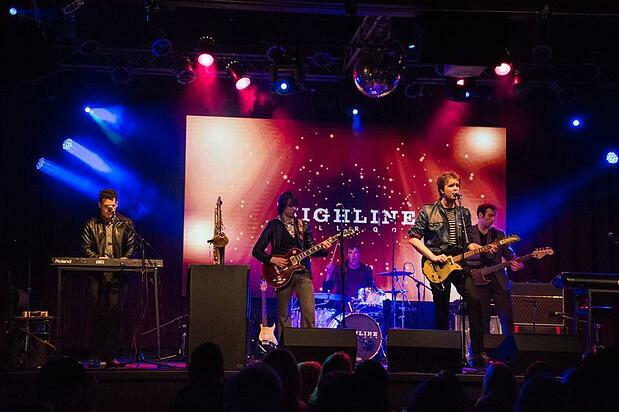 But for New Jersey-born musician and songwriter Graham Alexander, the band he started nearly 15 years ago is still going strong, regularly touring and releasing new material. What most people would be surprised to learn, though, is that in between pursuing his music career, it turns out Alexander is also a two-time award-winning Broadway performer. When we chatted with him recently about this, he explained to us how his work in theater helped him finance his rock project and expose him to new audiences, while also teaching him some valuable lessons about putting on a stellar show. For a pop-rock band, you have a very unique backstory – you're a two-time award-winning Broadway star. How has your theater experience informed your passion for rock? I feel like... any kind of act that does live shows can really benefit from some professional theater experience. I think the Broadway's (and I'm sure millions of other theater companies') approach to live performance is more rock 'n' roll – and way more fearless than most people realize. These performers on Broadway are really working hard every night for their passion, which is not something the modern club scene births in the way it did at the rock era heights of Bruce Springsteen (at the Stone Pony), or the Beatles (in Hamburg). Believe it or not, I'd very closely relate the plethora of musicians working on Broadway to those earlier rock club/band guys –they are professional rock stars with more clout in 2015. Very much like the Vaudeville show era that had to progress, so too has club rock from the 1970s. And these days, if that same tradition of musicians aren't playing a larger arena or concert hall (noting that a relatively new concept is how largely organized live music has become as a business, and how large that business is from clubs in the '70s to the modern day), they are likely on Broadway. Especially since Broadway has embraced more and more "modern popular genres" and jukebox rock-based musicals. Which came first for you, Broadway or your rock band? I started my band in 2000ish about a decade before I did my first Broadway show. Before that time, I played clubland and did a ton of touring. I also opened a recording studio, went to the UK, Europe, and all over the US, making music and developing my original material, and creating a presence in the industry. Eventually, in 2010, I auditioned for a Broadway show and got the role. That show ended a year later, but I'd been recording my first album. I took any money I made and reinvested it in my first album's promotion, as well as my band (simply called Graham Alexander), and we leveled up! You learn to be bolder when so much is at stake every night on the stage. I think you take that with you for life. While you were on Broadway and simultaneously pursuing your own music career, was it difficult to switch back and forth between the two? I haven't done any theater productions since I worked at the St. James Theatre in NYC in 2013, and before then it was 2011. Both times, I never stopped working on my own career. As far as I was concerned, both shows were fun jobs. But certainly they were most important for being able to fund my career a bit more. How did you champion your Broadway contacts to launch your rock career? Besides meeting my friend Christina Sees (who worked on the first Broadway show I did as social media manager, and very much helped Graham Alexander to understand and better our social media marketing, among other things), I'd say my career in original music was already 10 years or so in the making prior to that show. Certainly the press allowed the audience to grow.... [It connected] me with people that loved the music I was making on my own, while providing much needed income while I invested in my own career. When you put on a show with your band, how does your taste for theater influence your stage production and performance? Do you feel like you have an advantage? I would say that my shows have absolutely improved based on my Broadway experience. You learn to be bolder when so much is at stake every night on the stage. I think you take that with you for life. I'm very, very happy with that experience, because it took my original shows to new levels of energy. In live theater, you can't have an off night – people paid their last dime for those seats. There is no way I want to be blamed for disappointing them! Do you plan on continuing to actively pursue a Broadway career, or are you focusing just on your own project now? I was always a rock 'n' roll/pop/songwriting musician, and the bottom line was that that was what got me the roles on Broadway. Broadway was a fantastic job, but it wasn't my end point, and I always knew that being too comfortable could lead to complacent attitude towards my songwriting. I made a point of never stopping songwriting, recording, or playing live shows with my band. We just all kept going and scheduled it around Broadway shows for a short time. I just finished some songwriting/production work for a new show that Marvel/Disney commissioned me for, which was a very exciting thrill to know people liked my own material enough to invest in some brand new compositions/songs – that should be out in 2016. As a Broadway performer, record label owner, and musician, what has been the biggest lesson you've learned thus far about the industry? In many ways, what I've learned is that the artist makes the industry, not the other way around.